Full-service metal stamper PTM Corp. has been on a “wild ride” the last few years, according to the company’s sales and marketing director Mark Cross. Specializing in design assistance, prototyping, four-slide and progressive-die design and build, as well as short- and long-term production, PTM has been on a mission to become a turnkey project manager. Some 70 percent of the firm’s business falls under the heading of automotive, the rest for customers in the aerospace, medical and other industries. An operator at the PTM advanced engineering center takes a resistance-welding gun in hand to work his around a fixtured wheel-housing assembly comprising 18 stamped parts, some of which are galvanized. Thanks to adaptive process control, he need not worry about material stackup, the presence of adhesive in the joints or other variables. The control automatically senses resistance during every weld and adjusts the weld schedule accordingly, generating the specified amount of heat to ensure good-quality welds—all 275 of them. 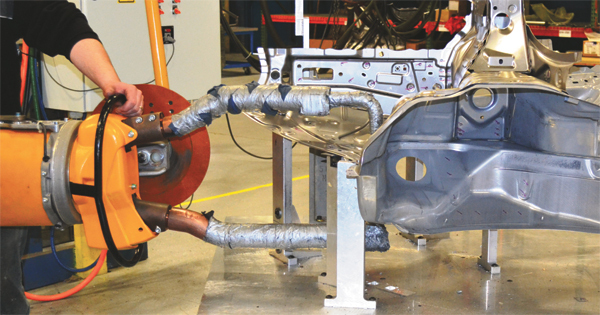 The adaptive weld-control system Cross speaks of is the MFDC 560, supplied by Aro Welding Technologies Group, a French company with U.S. headquarters in Chesterfield Township, MI. PTM added the Aro system to its newly formed advanced engineering center in mid-2011. The center, born in 2009, focuses on prototype and short-run production and occupies a 30,000-sq.-ft. facility in Frazier, MI. It’s soon moving to a new 57,000-sq.-ft. facility under construction on PTM’s 72-acre main campus in Fairhaven, MI—also home to the firm’s 125,000-sq.-ft. main production plant. The new prototype/ small-lot production facility, due to open in mid-2013, will house five- and three-axis laser cutting and welding machines, a handful of stamping presses, coordinate-measuring machines, six manually operated resistance-welding guns and a few pedestal RSW machines. Manufacturing engineer Chris Gastmeier led PTM on its mission to take its RSW capabilities to the next level. The impetus for the investment: a new wheel-housing assembly program directed to the company early in 2011 from a large automotive-OEM customer. The program, which kicked off last October, required PTM to assemble 300 prototype wheel housings—150 each of left- and right-hand assemblies. Each comprised 18 stamped components assembled via 275 spot welds—300 assemblies, 275 welds each, amounts to 82,500 welds. Some welds join two sheets, others join three sheets; some joints contain adhesive and a few of the parts are of galvanized sheet. Material thickness ranges from 0.023 to 0.085 in. Completing the variety of welds throughout the assembly requires a PTM operator to manually move a welding gun from spot to spot. Without the Aro adaptive controller, he typically would set the system up for one programmed weld schedule and move around the fixtured assembly to complete like welds (same or similar weld-joint thickness and surface condition). He then would have to stop welding, put the gun down and move to the controller to call up the next weld schedule needed to complete another set of like welds. Then he would pick the gun back up and complete those welds, and so on. That process would require excessive and repetitive movement around the assembly. It also would inhibit weld productivity, as the operator would waste time moving and adjusting the weld control, sacrificing actual welding time. Using the Aro, the process becomes streamlined since the control, in real time, measures resistance in each weld joint and adjusts the weld schedule accordingly. 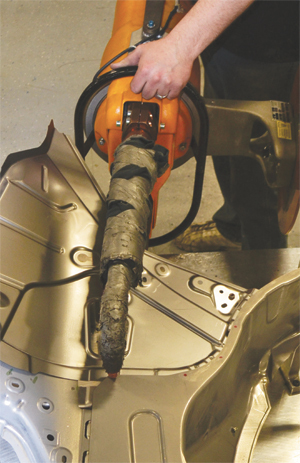 The operator can move quickly from weld to weld regardless of joint thickness or other variables, with little to no wasted movement. Thus he makes welds based on proximity and convenience rather than on the required weld schedule. No need to worry about galvanized or bare steel, two- or three-times sheet thickness or the presence of adhesive in the joint. And, the control can sense changes to the process as the welding electrodes wear, making the appropriate weld-schedule adjustments to ensure good-quality welds. “The Aro adjusts the three key process variables—current, time and force—in real time to generate precisely the amount of heat needed for each weld,” says Gastmeier. “It can adapt for any condition that affects the resistance in a given weld joint. PTM completed the wheel-housing job in January 2012, releasing completed assemblies to its customer in lots of 25 to 30. In addition to making speedy work of each assembly’s 275 welds, the adaptive control also makes fast work of the daily startup procedure the operator follows to verify that the welder is properly functioning. Before bringing in the Aro system, this every-morning startup procedure entailed performing coupon tests of every variation of sheetmetal type and joint thickness that would be welded that day. That verification process consumed at least one hour every morning. Accompanying the adaptive control to PTM was a pair of new Aro Ergoflex welding guns. One control can manage both guns and two operators simultaneously—another time saver for the company. The Ergoflex design employs a central gun body to which the user can affix any of several available sets of arm styles and sizes. PTM uses guns with 30 in. of reach and a 20-in. jaw opening. See also: Aro Welding Technologies Inc.